Discussion in 'Tesla, Inc.' started by vfx, Aug 17, 2009. Anyone know if the TESLA font is custom or something that exits in Fontland? I want to put the word ELECTRIC on the Tesla. What the Font had no good suggestions. I believe they contracted a design studio for the "TESLA" logo. I'm sure someone could develop a computer font based on that. Kinda looks like a variation on the old seven-segment display. This guy specializes in copying popular logo fonts. He does font copies of movie posters, TV shows, and theme park rides. This is his version of the Tesla font. He even says it's for cars and as you showed, uses the word electric as a sample. As I have read somewhere else: "TEG, the searcher, never sleeps." Great find. I will contact the guy to make sure that the font is nearly exactly the "Tesla font". When I get my roadster somewhere sometime, I want to add the word "electric" at the place where the Brabus Roadster has its "Brabus Tesla" logo; in some kind of similar design (white font on black background). If it looks good. if not than not. USD 25.00 for the font will not bring the car purchase budget out of balance. I mailed to David Occhino, and got a fast and supportive answer. The Emblem software is what you are looking for. The Emblem font comes in 16 styles, and I recommend using the letters "L," "C," "T," "R" and "I" in Emblem Bold C and the letter "E" in Emblem Bold D to achieve the final result you seek. 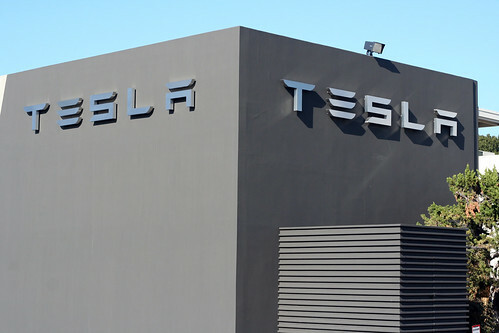 You'll need to add additional kerning between the letters in order to match the spacing found in the Tesla logo. You will be very pleased with the results. I already bought the font and would have worked this out by myself but Thank you Alpine Driver for doing this. As you have all surmised by now, I'm looking to put "electric" on our car somewhere. Probably the back window. Still waiting for all the other stickers to arrive 1st. This font or it's kin might also be good for TMC and it's branding. I wonder if Linda Nicholes will want to "upgrade" her sticker? I've talked with Linda extensively about her lettering. She said someone jus walked up to her and "gave" it to her at an alt car show. There is an outside chance someone can find the supplier but I ultimately have chosen a different route. I mentioned the current placement is a bit cluttered being so close to the TESLA logo. She said Tesla does not like it. I suggested that she move it down to the bumper for clarity. She wishes she had done that. She is a proud EV advocate and has even talked about putting "Electric" on both sides of the car. It's also important to note that her letters are 3D. The are plastic chrome and protrude out maybe 3/16 of an inch (further than the TESLA letters) That's why they get that highlight shift as you or the car moves through reflecting light and shadow. They are really nice and I would recommend them to anyone (if they can find the maker!). I have just opted for window placement and 3-D chrome lettering seems silly on glass. Played around with the font(s) today. There are 4 versions and you can indeed make the TESLA logo in a (PC) True Type font. The word ELECTRIC looks good in several of the versions and even better playing mix and match with individual letters. Now I need to decide placement and size on the back window. I have an idea but I'm waiting for the other state stickers to arrive to lock in total layout. Thanks again to TEG for some terrific sleuthing. I saw those "electric" signs/decals at the Santa Monica Alt Car Expo. The company had several different variants of them for sale, but I can't remember their name. Linda's are from Third Planet Energy. You can find it here. Stefano got the same thing for his Mini-E.
.:: Autobadgez ::. Badges, Emblems, 3D Chrome Letter Kits, and Auto Accessories for Cars and Trucks ::.